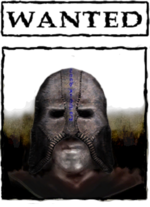 The Gray Fox is the mysterious leader of one of the most secretive organizations in Tamriel, the Thieves Guild. Among the common population of the Empire it is often rumored that he can turn invisible at will, shrink to the size of a mouse, turn into mist and seep under locked doors, while most members of the Imperial Legion simply believe him to be a myth, nothing more than another common thief. Among his followers, however, the rumors that flow around are quite different; they instead comment about the mysterious figure that he represents, said to have ruled the Thieves Guild for about 300 years, questioning if he could even be immortal. That is everyone but a single fellow thief who goes around known only as the Stranger, who instead comments that he is said to be the one responsible for the theft of the Gray Cowl, his most significant feature, from the Daedra Lord Nocturnal. For the most part of the Thieves Guild questline the only information that you will receive about him are rumors and tales, however once you have taken care of the most troublesome Captain of the Guard Hieronymus Lex, who seems to be the only one that believes the legends about the Gray Fox, S'Krivva will inform you that the Gray Fox himself may request a meeting with you very soon, which turns out to be true, as Methredhel will inform you that the Gray Fox requests an encounter with you to appoint you with a very special assignment. At this point you are directed to see him at Helvius Cecia's house in Bruma, where he will make a brief appearance to inform you about the errand that you are to carry out for him before disappearing, and a second time when you report back to explain the details of the mission. He keeps this behavior during the subsequent set of quests that he gives to you (See this section for details). For your second assignment, you are asked to see him at Malintus Ancrus' house in Chorrol, when this time you are requested to steal a very special arrow that is currently in the possession of a powerful Court Wizard. As Amusei will inform you, for your third task the Fox will be waiting in Ganredhel's house in the city Cheydinhal, where you are assigned with the errand to steal the Boots of Springheel Jak from the descendant of a famous thief. 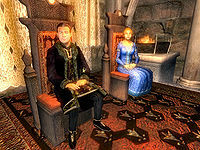 For your final task, he requests a meeting at Othrelos' house in the Imperial City, where he will fill you in with the details of his plan to carry out one last great heist, requesting you to steal one of the legendary Elder Scrolls from the Imperial Palace. Once you return to him with the news of your job, you may notice that something is strange, as he will ask you for a final favor: to deliver a very special ring to Countess Umbranox in Anvil, only to be revealed that he was the missing Count of Anvil Corvus Umbranox all along, and that he is now willing to bestow the title of the new guildmaster of the Thieves Guild upon you in order to return to his old life before he inherited the Cowl. The Gray Fox's equipment contains some of the rarest items in Cyrodiil. He is clad in a Weaponward Cuirass mixed with a pair of leather greaves, the Boots of the Olympian and the Gray Cowl of Nocturnal itself and also wears a ring of Ring of Alteration and a Ring of Thieves. He also keeps in his inventory a full set of lower-class clothing, namely a patched vest, a pair of sack cloth pants and sack cloth sandals. He is armed with a leveled shortsword, always unenchanted, and also carries around two potions of Cure Poison and three strong potions of Healing just in case he finds himself in a tough situation, along with a high amount of gold. In combat, aside from relying on his trustworthy sword, he also possesses some spells to assist him. He is able to cast spells from the schools of Illusion and Alteration and a single spell from Destruction, including the novice-level Spark spell, the apprentice-level spells Defend, Electric Shell and Sea Stride, the expert-level Shadow spell and the master-level spell Silence. Added to that, he also possesses a lesser power that costs him nothing to cast named "Gray Cowl Invisibility", which grants him Invisibility during 300 seconds. "He's been around for hundreds of years. I've heard tell that he is immortal. I don't know about that, but he sure ain't normal." "He's been around forever. It must be 300 years or more since he took in charge. I'm not sure he's even human." "Nobody knows who he really is. He's always hiding under that weird cowl. Kinda spooky if you ask me." "He is the greatest of all thieves. I have heard it said that he stole his gray cowl from Nocturnal herself." "We don't talk about him in public. The Thieves Guild follows the Gray Fox. However, we make sure that most folks think he is just a myth." "Yes, I want to work with him." "Yes, I want to rid the city of him." "No, just curious about him." If you choose "Yes, I want to work with him. ", the beggar will say: "I think I trust you enough to tell you this secret. To learn more about the Gray Fox, go to the Garden of Dareloth at midnight. Look in the Waterfront district of the Imperial City. I can say no more." Your journal will be updated for the quest Finding the Thieves Guild which will allow you to enter the Thieves Guild at the advice of a beggar. If you select "Yes, I want to rid the city of him. ", the beggar will say: "I don't blame you. He's a menace to society. Let me know if you find out anything." However, their disposition will come down by 15. If you choose "No, just curious about him. ", the beggar will simply say: "He's a fairy tale. 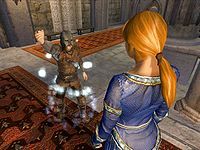 The Imperial Watch pretends there is a thief king named the Gray Fox who controls all the thieves in Cyrodiil." Once you have taken care of the annoying Hieronymus Lex by making him the new Captain of the Guard of Anvil, S'Krivva will tell you that she no longer has any more special jobs for you to fulfill, as you have now achieved the rank of Shadowfoot and thus don't have need of any Doyen to provide you work. However she will inform you that there have been recent rumors around the guild that the Gray Fox himself may be needing your services soon, and suggests you to keep the Guild Fences busy in the meantime. Once you have fenced stolen goods worth at least 600 gold, you will be contacted by one of the personal messengers of the Gray Fox, your fellow Guild member Methredhel, who will inform you that the Fox has personally requested that you travel to the city of Bruma, to Helvius Cecia's house, apparently because the Fox has noticed your talent and now wishes you to work for him. Once you have arrived there, you will find the mastermind of the Thieves Guild. He will proceed to explain some of the details of the job: "I have need of your special gifts. There is an item, hidden away in a remote monastery. I need you to go get it for me. The monastery is extensive and well guarded, so you should make sure to be well prepared. Should you succeed, I will pay you well for your services"
Once you feel prepared and accept the contract, he will proceed to explain that you are to infiltrate the hidden monastery known as the Temple of the Ancestor Moths, as he has need of an artifact known as Savilla's Stone and that is said to be in possession of the monks: "Capital! The monastery is called the Temple of the Ancestor Moths. It is where retired, blind Moth priests go to wait out the rest of their days. I will mark the location on your map. Look for it in the far northeast of Cyrodiil, beyond Cheydinhal. I need you to acquire Savilla's Stone. It is a large crystal with special properties that I need to gain... advantage. Remember, do not shed innocent blood. However, there is no bloodprice for slaying the stone's guardians, human or inhuman. When I receive word that Savilla's Stone is missing, I will be here waiting for you." Once you return with the crystal in your hands he will eagerly ask if you have been able to recover it, telling you thrilled that you may be summoned again once you inform him that indeed you have: "Capital! Now I can see past the palace defenses. It's a good thing the Emperor didn't know they had this stone. He would have had it destroyed or taken it from them and kept it under lock and key in the palace. When I have learned what I need to know, I will call for you again. Let us leave Helvius' house now. He has served me well and deserves his peace." However, if during your tour around the Temple you managed to recover a mysterious note titled Instructions: the Gray Cowl you will have the unique opportunity to interrogate him about the legend behind the Gray Cowl and the Daedra Nocturnal, to which he'll respond with a mix of anger and sadness:" I suppose there is no hiding it from you. No hiding. What a joke! My whole life is hiding. Everything in that document is true. My identity cannot be known. In fact I just told you my true name twice, but I bet you don't remember it. You and I have even met before, when I was not wearing the cowl. To your clouded memory he and I are two different people. My own family doesn't even know me. I would give much to be rid of the Gray Cowl and its curse." 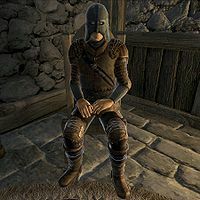 After you have fenced over 700 stolen goods to the currently available merchants of the Thieves Guild, you will be contacted again by the Gray Fox, this time by your former opponent Amusei acting as the messenger, requesting that you present yourself in Malintus Ancrus' house in the city of Chorrol, where he is waiting for you to assign you a new task:"My work with Savilla's Stone has revealed that I need something special for my plans. It's a small item in the possession of a powerful court wizard. Will you do this for me? I will pay you well." This time you are to steal an item known as the Arrow of Extrication that has fallen into the hands of the Bravil Court Wizard Fathis Aren, as he will explain once you accept to carry out the job: "Capital! Bring me the Arrow of Extrication. It has a key shaped head. Bravil's court wizard, Fathis Aren, recently acquired this unique item. You may kill Fathis if necessary, but not in the castle. My spy network will tell me when you have it. Return here with the arrow when you do. Now we should get out of Malintus' house before we wear out our welcome." Although he will show some disappointment when you inform him that you were only able to recover only the arrow's head, he will nevertheless proceed to tip you for another job well done, as well as promoting you to Master Thief, the highest rank that can be achieved by members of the Guild: "Hmmm. I had hoped for the whole arrow, but that is not your fault. I will have to have it repaired. This arrowhead advances my plan to... nevermind. I may have need of you again in the near future, if my plans hold. Here is your reward. I am also promoting you to Master Thief in the Thieves Guild. Fathis Ules of the Imperial City will be your new fence." In order to keep receiving special jobs from the Gray Fox you will need to be active in the Guild, and thus the Fox will only send Amusei to you only after you have fenced a sum of at least 800. After Amusei has delivered the next message you will learn that you now need to head over Ganredhel's house in Cheyndinhal. Once you have arrived there, he presents you with the next assignment that he wants you to carry out. Apparently this time he needs to acquire the Boots of Springheel Jak in order to be able to successfully carry out an even greater plan: "Further use of Savilla's Stone has revealed that I need another special item to move forward with my plans. I need the boots of Springheel Jak. He is a famous thief that died some 300 years ago. Legend has it that he was buried with his boots on. Find out where Springheel Jak is buried and bring me back those boots. Will you do this for me? It pays well." After you agree to complete this task he will quickly fill you in with the details about the current location of the boots. They are in the possession of the only descendant of the now-dead thief Springheel Jak, Jakben the Earl of Imbel: "Capital! The Earl of Imbel is the only descendant of his line that I have been able to locate. His name is Jakben, and he lives somewhere in the Imperial City. There might be a clue in the Earl's house." Once you have returned with the boots, he will excitedly exclaim that he's getting closer to fulfill his plan although he seems reluctant to tell you anything about it yet: "Capital! This may be the last piece of the puzzle. I need to spend some more time with Savilla's Stone first. I am truly indebted to you. If all goes well, I may call upon you for one last task. The danger will be great, but the reward will be greater. For now, here is your reward. Let us leave Ganredhel's house and go our separate ways. We have overstayed our welcome." However, if you read Jakben's diary after having acquired the boots you may question him about his mysterious persona, this time regarding whether it's true that he actually knew Springheel Jak. In his response he will clear the questions about how it is possible that he has led the Thieves Guild for so long: "Ah. It seems you have stumbled over a bit of history that few in the Thieves Guild ever discover. I am not the first Gray Fox. That master thief died some time shortly after stealing the Gray Cowl and receiving Nocturnal's curse. However, another thief in the guild picked up the cowl and assumed his identity and the curse. No-one in the guild knew it was a different person. Over the centuries there have been dozens of Gray Foxes. To the rest of the world he seems immortal and unchanging. I am hoping to be the last." As you may have guessed, the Fox needs to know that you are ready to face what is to come and thus he will only send Amusei to look for you only after you have sold stolen goods worth 1000 gold or more. Once he deems you worthy he will send a message telling you to meet him at Othrelos' house in the Imperial City. It seems that after three special jobs to acquire some very special items, the Fox is now ready to reveal what his plan was from the very beginning: he plans to steal one of the legendary Elder Scrolls: "This is the big one. This is the heist that will be written about and talked about for decades to come. We are going to steal one of the Elder Scrolls from the Imperial Palace. Are you ready for this challenge?" If you inquire more about this unusual and risky job he'll let you know that: "There is no buyer. This is for glory, not for money. Our names will become legend. I also have a personal need for this particular scroll. As for your compensation, I ask you to trust me. If my plan works, you will get a reward worth far more than mere money. Will you do it?" The prize that will make you a legend. After you feel prepared you may accept the task, to which he anxiously replies: "Capital! I have worked for eleven years planning this heist. Savilla's Stone provided the last bit of information I needed." And then proceeds to explain the complicated details of the plan: "The Elder Scrolls are kept in the Imperial Palace behind a door that cannot be breached. Savilla's Stone has revealed a path around this door. You will have to travel the Old Way. Once used as an escape route for Imperial Emperors, it has been forgotten for centuries. To unseal the entrance you must sneak into the basement of the palace and activate the Glass of Time, whatever that is." Asking him about where the actual entrance to The Old Way is will yield the following response from him: "In the Imperial Sewers. Here is the key for the gate to that section of the sewers. I picked the pocket of Ocato himself to get it. My scrying with Savilla's Stone has provided clues, but not the details. I know the tools you will need there, but not the obstacles themselves. The boots of Springheel Jak will allow you to leap to an unreachable place. They will also protect you from a long fall. The Arrow of Extrication is the only way to unlock the final door. Take them both." Proceeding to let you know what to do once you have successfully infiltrated the Palace: "Once you are inside the palace itself, you need to find the reading room. The blind priests will deliver a scroll to you there. I arranged for the notable Celia Camoran to want to read a particular Elder Scroll. Don't ask how. However, she will be... unavoidably detained. You will take her place. Do not speak to the priests. They are blindfolded and will not realize it isn't her unless you speak. As the guildmaster, I am waiving bloodprice for anyone you kill during this heist. However, I can't stop the Watch from putting a price on your head." Finishing the explanation by delivering you a book in case you forget something: "I have written it down for you in this book. I've chosen you because you are the best. Good luck." "By the power of the Elder Scrolls..."
Gray Fox: "By the power of the Elder Scrolls I name Emer Dareloth as the true thief of Nocturnal's Cowl." Millona Umbranox: "You're the Gray Fox! I've been betrayed!" G: "I am the Gray Fox, but you have not been betrayed." G: "I am also your missing husband, Corvus." M: "Corvus! Is it really you? Ten years I've waited for word from you. Why did you hide from me?" The Gray Fox, now known as Corvus Umbranox. G: "Ten years ago I inherited this cowl from the former guildmaster of the Thieves Guild. I became the new guildmaster, but I also received it's [sic] curse. 'Whoever wears Nocturnal's cowl shall have his name stricken from history'. Once I donned the cowl, no-one in all of Tamriel could recognize me. With the cowl I became the Gray Fox. Without it, I was a stranger, even to you." M: "You mean you were unable to return?" G: "I've stood right next to you, and you didn't even know it. I cried out to you 'Here I am! It's me, Corvus!' but you just looked at me, confused." M: "You have broken my heart for a second time. I cannot let the infamous criminal mastermind, the Gray Fox become the Count of Anvil. If you try to announce yourself as Corvus, I will deny you. I will deny you before the Emperor if I have to." G: "I guessed you would say these terrible things to me. That is why I brought my friend along. From this moment forward , I renounce my life of crime forever. I am passing the Gray Cowl of the Thieves Guild to it's [sic] new guildmaster." He'll then approach you to reward you for your loyal service to the Guild by naming you the new Gray Fox: "The Gray Cowl is now yours. You are the new guildmaster of the Thieves Guild. You will find that history has been altered tonight. Such is the power of Nocturnal's curse that lifting it can alter time itself." Asking what is different will reveal that due to the broken curse of Nocturnal's Cowl, he will tell you that: "If Emer Dareloth had not stolen Nocturnal's Cowl, the Thieves Guild would have never fallen on such hard times. Because of the curse, he was unable to operate in the normal world of business and society. He could only act as the guild's figurehead. That has been undone. 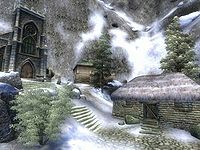 If you go to the Imperial City, you will find that the Thieves Guild has a guild hall on the site of the ruins of Dareloth." Once he finishes his speech he departs to finally reclaim his place as the former Count of Anvil Corvus Umbranox.